Donated by Susan Molofsky Todres, May 2007 (Accession 2007:28). The H. Herbert Wanner Papers are composed of two series: H. Herbert Wanner, and Mary A. (Stephens) Wanner. Each series is arranged chronologically. H. Herbert Wanner was born in 1882 in Leesport, Pennsylvania, the son of Oscar and Amelia (Delp) Wanner. He attended the Medical School of the University of Pennsylvania from 1902 to 1905 and graduated from Thomas Jefferson Medical School in 1907. Prior to medical school, he had worked for sometime as a teacher. Wanner practiced medicine in his hometown of Reading, Pennsylvania. H. Herbert Wanner married Mary Amanda Stephens (1881 – 1975, Baltimore, Maryland) in Berks County, Pennsylvania in 1908 and had two children: H. Herbert, Jr. and Betty A. Wanner. H. Herbert Wanner died in 1963 in Baltimore, Maryland where his son lived at the time. This collection records some of the daily everyday activities of a middle class family from the Reading, Pennsylvania area. The collection consists of a group of printed pocket diary books which had space for short entries on each day. The writers used these books primarily to record brief descriptions of their activities and appointments. H. Herbert Wanner’s diaries include entries describing his medical school studies, family visits, growth of his children, and attendance and participation in church activities as well as financial accounts of expenses and income. 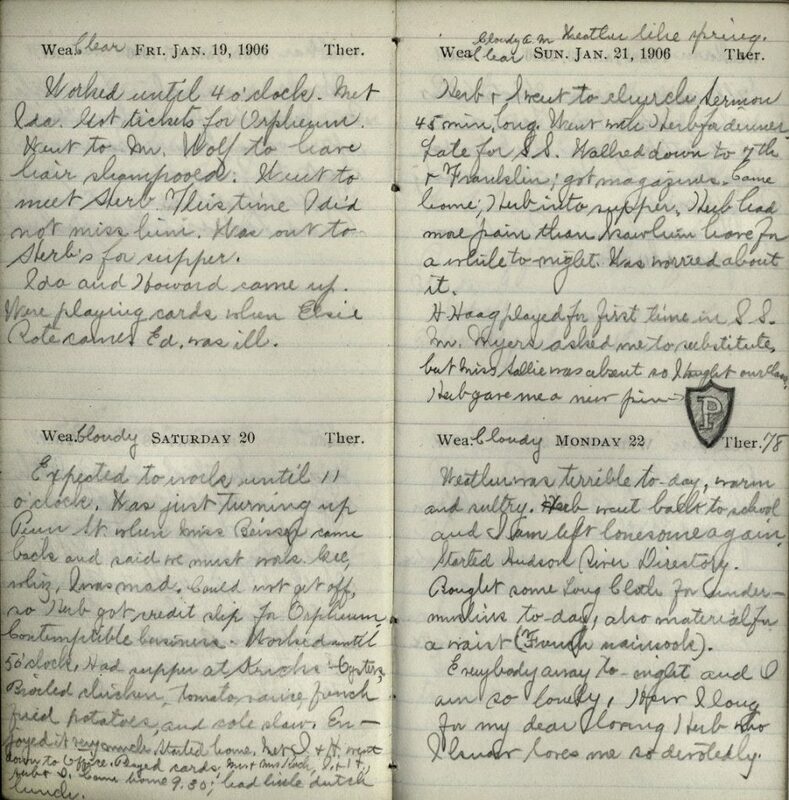 Mary A. Wanner’s diary is slightly more detailed in describing her daily activities, such as meetings with her future husband, church events, and personal hygiene matters (hair washing). The entries in almost all the books are not complete. The writers tended to fill the books regularly at the beginning of the year and then leave most of the entries of latter half of the books empty.